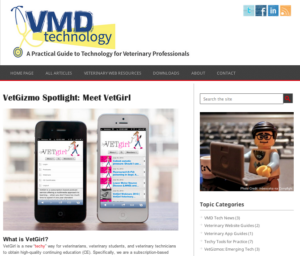 There has been serious buzz around VetGirl since our launch 2 months ago! The VetGirl team is excited to see our passion come to life! VetGirl is THE new “techy” way for veterinarians, veterinary students, and veterinary technicians to obtain high-quality continuing education (CE). Our latest buzz comes from VMD Technology. As you already know, VetGirl is a tech-savvy, multi-media experience, with podcasts, webinars, videos, and blogs to enhance learning! Caleb Frankel, VMD and VMD Technology share a similar passion. The goal of VMD Technology is to help you discover tech tools to continue your education. As Dr. Frankel says, veterinary medicine is advancing faster than most can keep up. Thankfully, technology has advanced as well. More importantly, VetGirl is that advanced technology! Founded by Dr. Justine Lee, DACVECC, DABT, CEO and Dr. Garret Pachtinger, DACVECC, COO, VetGirl is designed for veterinarians with "time poverty" who want to learn on their time. With VetGirl, you can use technology to your advantage learning on your smartphone, tablet, laptop...practically anything with an internet connection! If you have any questions about VetGirl, let us know! Also, don't forget to check out VMD Technology and say hello to Dr. Frankel!